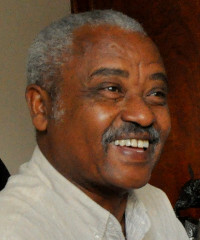 Hailu Tessema was born in Ethiopia’s capital of Addis Ababa 62 years ago. He graduated from Asfaw Wossen comprehensive high school in Ethiopia in 1973 and obtained employment in the supply department of a construction company where he worked for around 15 years. He also served as the General Manager at Ethiopian Coffee Roasters Association for three years through which he supplied roasted coffee to local hotels. During this time he began to dream of creating his own company. In 2003, Mr. Tessema’s dream came true when he launched a family business called Mama Fresh. Mr. Tessema’s wife Konjit, who studied town planning, is the Mama in Mama Fresh. Their son Miraf Selassie, joined Mama Fresh a few years later after completing his university studies, and took charge of the marketing of the business. Mr. Tessema also has a daughter and believes that in time one or more of his grandchildren will also join the Mama Fresh administrative team. Mama Fresh obtains the nutritious grain known as teff from a local farmers’ union with approximately 300 members. The teff is then turned over to the nearly 100 employees that are working in the Mama Fresh kitchens and bakeries to make injera. Making injera involves grinding the teff into flour, mixing the teff flour with water, allowing the mixture to ferment for four days, and scooping and pouring the fermented mixture onto a heated clay surface where it sizzles and turns into a spongy pancake-like flatbread. Injera is a staple food in Ethiopia and is eaten by people of all backgrounds. It is also enjoyed outside the country, especially at Ethiopian restaurants, including several dozen in the USA, Europe, and West Africa that are supplied by Mama Fresh. Mr. Tessema views Mama Fresh not only as a way to share Ethiopia’s traditional foods with the world, but also as a means to provide employment for people, especially women, in his home area. Around 95 percent of Mr. Tessema’s workers are female. They work at Mama Fresh Injera in Addis Ababa and receive free meals at work. Breakfast, lunch, and dinner are served across two work shifts. The first workers arrive at 8am and stay until 5pm with an hour lunch break. The next shift begins at 6pm. Mr. Tessema believes that creating jobs through Mama Fresh is a good way to support his country. Although only a bit more than a decade old, Mama Fresh Injera is already one of the largest commercial manufacturers and exporters of fresh-baked injera. Mama Fresh not only supplies major hotel chains like Sheraton and Hilton in Ethiopia, but also exports around half of the injera it produces to Ethiopian shops and restaurants. Mama Fresh is built on good relations with the local community (that not only supplies workers, but also the clay surfaces of the cookers used to make the injera), local investors, and the national government. In 2014, Mama Fresh received a substantial investment from RENEW, an early stage venture capital company based in Addis Ababa, with US-based headquarters. RENEW is bankrolling the construction of a new export-focused factory for Mama Fresh. The additional factory should enable Mama Fresh to triple its production which is already substantial and includes Ethiopian Airlines flying 3,500 or more fresh injera and spices to Washington, DC from Addis Ababa four to five days each week. Injera is also being flown by Mama Fresh to Sweden three times per week, Norway twice a week, and Germany three times per month. RENEW’s experience and Mr. Tessema’s growing knowledge of the US market through his travels there, will assist Mama Fresh’s two US-based representatives, Gutu and Kiyar, to boost sales and distribution. Demand for injera is on the rise and Ethiopia is a great place to grow a business. The Ethiopian government has actively helped Mr. Tessema build his successful business and provided excellent support. The construction of the new 2,500 square meter factory (around 26,910 square feet), which is anticipated to be 80 to 90 percent completed by January 2016, is being built on land that was offered to Mr. Tessema by the government at a nominal cost. Mr. Tessema believes that with the new facility that he will have 300 to 400 employees within five years. His optimism is realistic. Ethiopia has one of Africa’s fastest growing economies. Although the growing of the tiny teff seeds used to make injera was once largely restricted to Ethiopia, today teff is grown elsewhere in East Africa as well as in Mediterranean Europe and the USA. The growth is driven by the fact that teff has the potential to be a new ‘super food’ due to being gluten-free, and high in iron, calcium, and protein. Teff flour also is versatile. It can be used to make any flour-based food, including bread, pasta, pizza, cookies, and tortillas. For businesspeople like Mr. Tessema, potential hurdles to be overcome include that teff is still relatively unknown and that a rapid rise in demand for teff overseas could drive up teff prices beyond what local growers can afford to purchase. Mr. Tessema is watching these factors and expanding his business to include non-teff-based products, such as spiced chickens and sauce and other traditional Ethiopian foods. By 2012, less than ten years after Mama Fresh’s founding, Mr. Tessema and his innovative business were recognized by Ethiopia’s Prime Minister for their contributions to society. In 2015, Mama Fresh and its founder Mr. Hailu Tessema were recognized once again, this time as the number one small enterprise exporter in all of Ethiopia. The recognition came from the Ministry of Urban Development, Housing and Construction in Addis Ababa and Ethiopia’s Prime Minister Hailemariam Desalegn presented Mr. Hailu Tessema with the award at a national ceremony. Based on the literature on international development and personal success, why has Mr. Hailu Tessema and Mama Fresh been so successful? Mr. Hailu Tessema had a VISION of distributing Ethiopian traditional food all over the world. This SPECIFIC AIM allowed the Mama Fresh founder to establish Ethiopia’s first large-scale factory producing teff-based products. He found LIKE-MINDED OTHERS, namely his family members, to support his dream. Mr. Tessema has noted that Ethiopia is the birthplace of coffee, a product that is now enjoyed globally, and that teff has the potential to become an important food worldwide. Mr. Tessema is PASSIONATE about his business. He graciously took the time to call me several times on the afternoons of May 30th and 31st so that I might learn more about his life and Mama Fresh. I would like to thank Mr. Hailu Tessema for his kindness. Amazing story! This guy is a hustler. He started with coffee, expanded to teff and now he is venturing in to other Ethiopian food items. Kudos to you Ato Hilu! Keep on working hard and introducing Ethiopian produce to the world. As an Ethiopian – American I am proud of you. And Big thanks to Frontani for sharing Ato Hailu’s story on your blog site.